Scroll down for information on all 5 of my novels: LOST GODS, KRAMPUS, The CHILD THIEF, DEVIL'S ROSE, and The PLUCKER. How vile your name upon my tongue. Like acid, hard to utter without spitting. Yet I find myself capable of speaking little else. It has become my malediction, my profane mantra. Santa Claus... Santa Claus... Santa Claus. That name, like you, like your Christmas and all its perversions, is a lie. But then you have always lived in a house of lies, and now that house has become a castle, a fortress. So many lies that you have forgotten the truth, forgotten who you are...forgotten your true name. I will always be here to remind you that it is not Santa Claus, nor is it Kris Kringle, or Father Christmas, or Sinterklaas, and it certainly is not Saint Nicholas. Santa Claus is but one more of your masquerades, one more brick in your fortress. I will not speak your true name. No, not here. Not so long as I sit rotting in this black pit. To hear your name echo off the dead walls of this prison, why that...that would be a sound to drive one into true madness. That name must wait until I again see the wolves chase Sol and Mani across the heavens. A day that draws near; a fortnight perhaps, and your sorcery will at long last be broken, your chains will fall away and the winds of freedom will lead me to you. I did not eat my own flesh as you had so merrily suggested. Madness did not take me, not even after sitting in this tomb for half a millennium. I did not perish, did not become food for the worms as you foretold. You should have known me better than that. You should have known I would never let that happen, not so long as I could remember your name, not so long as I had vengeance for company. Santa Claus, my dear old friend, you are a thief, a traitor, a slanderer, a murderer, a liar, but worst of all you are a mockery of everything for which I stood. You have sung your last ho, ho, ho, for I am coming for your head. For Odin, Loki, and all the fallen gods, for your treachery, for chaining me in this pit for five hundred years. But most of all I am coming to take back what is mine, to take back Yuletide. And with my foot upon your throat, I shall speak your name, your true name, and with death staring back at you, you will no longer be able to hide from your dark deeds, from the faces of all those you betrayed. 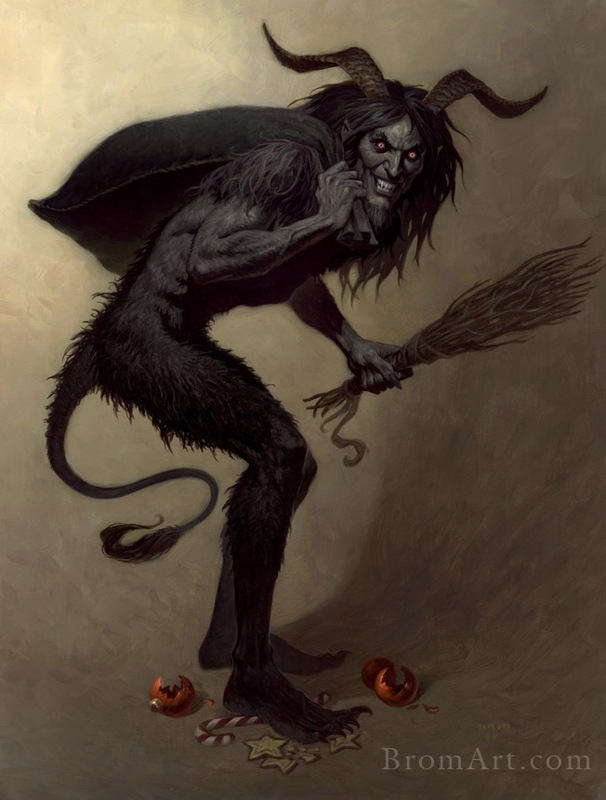 I Krampus, Lord of Yule, son of Hel, bloodline of the great Loki, swear to cut your lying tongue from your mouth, your thieving hands from your wrists, and your jolly head from your neck. Damnation is a road littered with pain, sorrow, and regret. None know this better than the man who rides that track everyday: Cole McGee, a once proud Texas Ranger, now condemned to hunt Hell's fugitives across the plains of both the living and the dead. But today Cole's luck might've changed. Something has escaped the deepest pits of damnation. Hell wants this something back at any cost and has offered Cole redemption in exchange for its apprehension. Sounds like a good deal to Cole, but as he closes in on his quarry he begins to realize you should never bargain with the Devil. 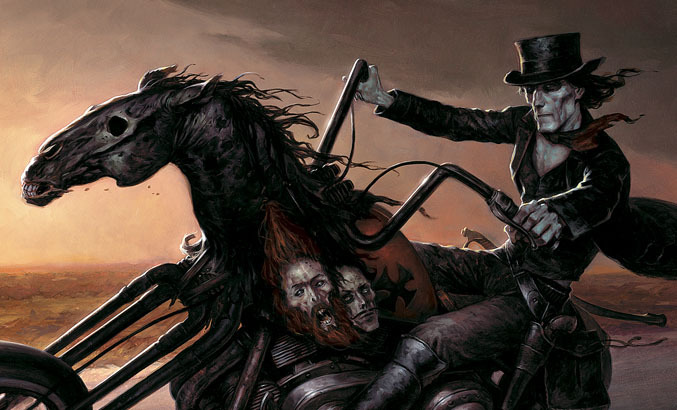 Following in the tradition of his award-winning first illustrated novel "The Plucker", Brom's dramatic prose and uniquely arresting images takes us on a ruckus ride from Hell and back in his illustrated novel "The Devil's Rose". Hardcover, 128 pages, full color, over 60 paintings. Available direct from Brom. Click on store link above for details. 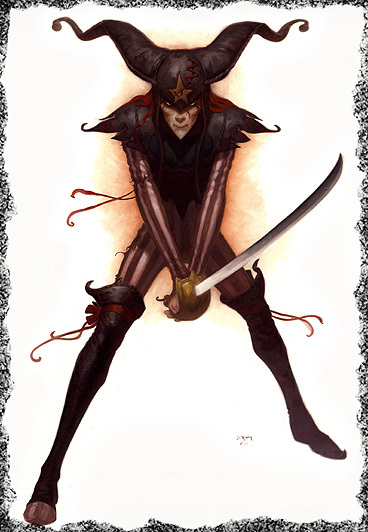 Brom intimately combines his dramatic storytelling with his uniquely arresting images, to create a work of striking imagination, a world where fairy-tale tradition collides with vileness and depravity, love and heroism, suffering and sacrifice. A shadowy land of make-believe where Jack and his box are stuck beneath the bed with the dust, spiders, and other castaway toys, forced to face a bitter truth: children grow up and toys are left behind. Jack believes this is the worst that can happen to a toy. But when the Plucker, a malevolent spirit, is set loose upon the world of make-believe and Jack is thrust into the unlikely role of defending Thomas, the very child who abandoned him, he finds out there is worse that can befall a toy-far worse. As desperation mounts, Jack is thrown together with Thomas's other toys-Monkey, the Nutcracker, and the ethereally beautiful porcelain doll Snow Angel-as they struggle to rise above their simple roles as playthings in an effort to save the boy they love.